The 14th South East Asia’s Renewable Energy Technology Exhibition and Conference will take place from Wednesday 6 till Friday 9 June 2018 in Bangkok, Thailand and focuses on the latest renewable energy programs, trends and development, including green energy opportunities for entrepreneurs. The show highlights renewable energy sources and the latest technology in this area. Wind and solar power are among the many systems and programs featured along with thermal energy, waste-to-energy and hydo-powered energy. Bio-mass and other green technology also covered. ASEAN’s largest & most comprehensive renewable energy, environmental & energy efficiency exhibition, will consist of: Renewable Energy Asia, Entech Pollutec Asia, Energy Efficiency Expo and Electric Vehicle Asia. 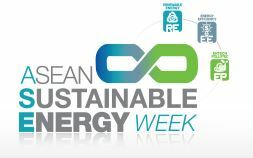 ASEAN Sustainable Energy Week will be held from 6-9 June 2018 at BITEC, Bangkok, Thailand. The ASEAN region presents huge opportunities for the use of Renewable Energy and member states are increasingly focusing on Renewable programs in order to reduce their dependence on fossil fuels. Renewable Energy systems and fuels help ensure a more sustainable and environmentally friendly power supply. They are also far more economical. Today, countries are doing their best to come up with individual renewable energy policies. For example. Thailand is currently promoting Renewable Energy as a national agenda supported by a master mlan called “Alternative Energy Development Plan (2012-2021).” The goal is to increase the share of renewable energy to 25% of the country’s energy demand by the year 2021. In Laos the government is embarked on developing biomass, biofuel and wind energy with the goal of achieving 30 percent of national energy consumption from Renewable sources by 2025. The Philippines has developed the Philippine Energy Plan 2007-2014 which emphasizes self-sufficiency for energy independence. The Plan increases the use of Renewable energy and alternative fuels for a much cleaner environment.